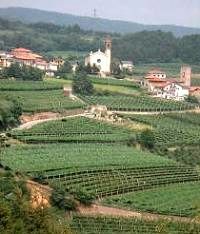 Trentino and Alto Adige, the North-easterly twin regions of Italian winemaking, are relatively unknown to the average wine consumer. This area, much like Alsace on the German border, has had a chequered history. Until 1919 it was part of Austria, known as the Südtirol. Though both Italian Alpine provinces, Alto Adige remains close to its Germanic roots, whilst Trentino is more or less 100% Italian, in terms of language, architecture, food and culture. Bolzano is the main city of Alto Adige, whilst 30 miles or so south, Trento is the main town of Trentino. It is here that I was based for a three-day visit to the region, as guest of CAVIT, the region’s wine-making giant.This was my first visit to this beautiful region. Flying into Verona, it is about an hour or so north by motorway to Trento, which sits at the foot of the snow-clad Dolomite mountains. This makes Trento a town popular both in summer, and for those pursuing winter sports. This is an area of industry and agriculture, with never-ending orchards lining the approaches, and pergola-trained vines covering the hillsides. Trentino is a relatively small winemaking region, though with around 10,000 hectares of vineyard, significant volumes of wine are produced. Trentino is unusual in that the industry is dominated by a mega-co-operative called CAVIT. In the 1950’s, a forward-thinking band of producers recognised that investment, technical development and marketing for this very distinctive region would be best served by working together. The nucleus of CAVIT was formed, and by the 1970’s a huge purpose-built winery and cellar dominated the town, with over 50,000 square metres of buildings. Today, CAVIT produces 70% of all wine from Trentino, and its membership includes not only hundreds of producers, but 13 of the 15 smaller co-operatives that operate in the region, thus making it a “second tier” co-op that provides research, viticultural and winemaking leadership, as well as marketing and distribution services. My visit would include plenty of tasting opportunities, but also trips to see the different vineyard sub-regions of Trentino. With their varying altitudes, soils and micro-climates, a whole variety of vines can be supported. We would also visit CAVIT’s beautiful estate, Maso Toresella, where an experimental vineyard centre looks into vine growing to research and refine what is best suited to the area, as well as preserving indigenous vines of the region. In fact, wines produced here run the gamut, from white, red and rosé table wines, to a large Spumante tradition, and both late-harvested and fortified dessert wines (vin santo). There is also of course grappa, a seemingly compulsory way to end a meal here, especially drunk from one’s freshly drained espresso cup (uno caffè correcto). The Cembra Valley (pictured right) is one of the most northerly and one of the most beautiful of the areas. Here, Alpine flowers and snow-capped peaks surround steeply-terraced vineyards growing aromatic grapes like Gewürztraminer, Riesling, Müller-Thurgau, and the red variety, Schiava. The sheer climatic and geographic diversity of the region is demonstrated by heading south for a couple of hours, back through Trento and towards Toblino, close to Lake Garda, where the vineyards enjoy a distinctly Continental, even Mediterranean climate. 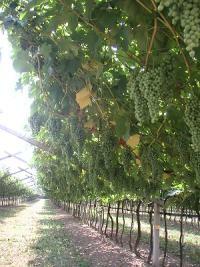 The grape vines which flourish here include Chardonnay, Merlot and Cabernet Sauvignon. But it is Pinot Grigio that is currently the hottest commercial success story of Trentino and of CAVIT. In the USA, Pinot Grigio has overtaken Sauvignon Blanc to become the second-biggest-selling varietal white wine after Chardonnay. And the biggest selling Pinot Grigio in the United States comes from CAVIT. With over one million cases sold in the US per year, CAVIT is one of the top ten importing wineries into the USA. The CAVIT HQ in Trento is mighty impressive: a high-tech, state of the art wine facility that is spotlessly clean, computer-controlled, and sophisticated to the nth degree. But my visit to their Maso Toresella was one of the highlights of this trip. At Masa Torsella life slips into a different gear, with the well-kept experimental vineyards running to the edge of Lake Toblino and the old Manor, once the summer house of the 16th Century Prince Bishops of Trento, now a stunningly beautiful reception area for entertaining guests. Here we had a glorious dinner on the terrace overlooking the lake. Though more clinical tastings would follow, this was a chance to sample local wines and cuisine as they are meant to be consumed. From the reception where I nibbled shaved Grana del Trentino (the local version of Parmesan), accompanied by some of CAVIT’s zesty, aromatic vintage Spumante, to a truly excellent Riesling-based Masa Torsella IGT, drunk with a crayfish and saffron risotto, it really was a magical introduction to the cuisine and culture of the region. Next day we travelled to the vineyards of various CAVIT members (left, typical Pergola-trained vines of the region). One of the most interesting was the Cantina Rotaliana di Mezzolombardo, a partnership formed between the co-operative of Mezzolombardo, and the Rotaliana Oenological Society. The latter was established in the 1920’s to preserve and raise the quality of DOC Teroldego Rotaliana; red wines made from the Teroldego grape. Since 1968 the Cantina has built on 100 years of winemaking, striving to produce Teroldego wines to compete with the world’s best reds. Their top wine, the Clesurae, is a vineyard selection of the best vineyards with an average age of 40 years. It is given the full Grand Cru treatment, with 18 months in new oak. The Clesurae is in many ways a standard-bearing flagship for the region, fusing ancient indigenous grapes with the latest thinking on winemaking. The strict controls on yields and use of new French barrels is as alien here as it was in the Barolos of Piedmont a decade or two ago. CAVIT are in many ways a model of modern business practices and forward-thinking. It is a huge achievement to have made this diverse region, composed of hundreds of small farmers, into a commercial force able to compete successfully in global markets. That level of commercial awareness means that seemingly everything produced by CAVIT is well-made, modern and captures a fine expression of the variety. The corollary is that there are few wines here as yet which will dazzle the aficionado in the way that the Grands Crus of Europe, or icon wines of the New World, have captured our attention. In the Lagrein Dunkel, Teroldego, Schiava and other indigenous varieties there is certainly regional typicity and some very goods quality. It will be fascinating to see how the finest wines of Trentino develop over coming years. Tasting notes from my visit include UK retailers and prices where appropriate. This is the huge seller in the US market, which I specifically requested to taste. Pale green in colour, it is immediately sweeter, plumper and more commercially-styled, with pear-drop and flowers and a peachy note. On the palate it is quite fleshy and rich, with orchard fruit flavours and, although slightly sweeter in style, a nice cut of lemony acidity. Very good. Beautifully light, honeyed nose with notes of dried fruits, saffron and tea-leaf, little hints of tropical fruit. On the palate more weight and fatness than the nose suggests, with apricot and fleshy nectarine fruit in a medium-bodied style, with undertones of unctuous toffee. Lovely balance and length, with a concentrated quality. Very good indeed/excellent. £9.99, The Winesmith, Peterborough 01780 783 102; Discover Wines, Herts 0870 3300267. This has a huge, spicy, exotic nose of incense and camphor, with cherry fruit and a deep damson and blueberry core. It has a rich, silky mouthfeel, with sweet oak tannins and bitter-edged cherry fruit. There’s a supporting depth of ripe oaky flavours and good acidity. Perhaps lacks a touch of flesh on the mid-palate, but very impressive. Very good indeed/excellent. A Bordeaux blend of Cabernet Sauvignon, Cabernet Franc and Merlot. It has a sweet-fruited nose, with lots cedar and woodsmoke, tobacco and a nice suggestion of bloody, animal character. Quite perfumed, with a little hint of violet. It has a good, fleshy mouthfeel, with soft, yielding character from silky tannins and expansive acidity. Good flesh on the mid-palate, and a long finish. Excellent. £12.99-£13.99, Partridges of Sloane Street, London 020 7730 7102; Enoteca Vino, Maidstone 01622 768328; Luckins, Essex 01371 872839. A little treat served at dinner in the excellent Scrigno del Duomo restaurant, this 46-year-old Vin Santo is one of a handful of bottles that remain in the cellars. It has a nose of fig, raisins and caramel, with a certain leafiness of stewed tea. It is medium-sweet on the palate, with soft flavours of brown sugar and raisins, and a sweet burnt caramel and walnut character like an old Amontillado Sherry. Sweetness shows through in the finish, with hints of chocolate and honey. Lovely stuff.